My name is Megan Kalie, and I’m studying English with a concentration in creative writing at Slippery Rock University. I attended the past three Elks Scholar Service Trips in Santa Monica, Asheville, and San Antonio, and the Elks National Foundation has changed my life immensely in only six months. Not only did being back in San Antonio feel like a homecoming, but getting to see familiar faces from previous service trips did as well. One thing I really loved about the 150 for 150 celebration, outside of all the great service work did, was watching everyone reconnect. Knowing I’d get to see people from the Santa Monica and Asheville trips again made me more excited for San Antonio than I could’ve imagined. I was happy with my own reunions, but seeing other scholars reconnect with friends they’d made on their service trips was a joy to witness, too. at the Elks National Convention in July. I had always heard of the Elks growing up since my dad is a member of the Hawthorne, Nev., Lodge No. 1704. For 11 years, I collected donations to purchase Girl Scout cookies to send to military service members overseas, and my dad’s Lodge donated money to my project every year. As a Legacy scholar, the Hawthorne Lodge sponsored my scholarship, but I had never been able to meet any of the members of the Lodge until the Elks National Convention this year. Because I was attending the 150 for 150 Service and Celebration Weekend, my parents decided to attend the Convention as well. My dad arranged a meeting with Hawthorne Lodge Exalted Ruler Kenneth Carrothers. We met Mr. Carrothers and I thanked him for the Lodge’s support. We talked for hours as I shared about my experiences on the Elks Scholar Service Trips. 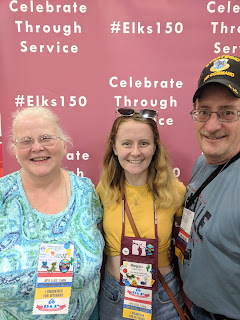 I told him about the volunteer service I do on the trips, and he was happy to learn more about my opportunities as an Elks scholar. In addition to allowing me to connect with my sponsoring Lodge, 150 for 150 was also significant to me because it gave me the opportunity to go back to a place I used to call home. While the two service trips I’d been on were fun and gave me an opportunity to help others, San Antonio held a different promise for me because I would be serving others in what was basically my backyard. I was only four or five when my family lived in Texas, so I couldn’t have understood what service was or that people so close to where we were living were struggling to make ends meet. with 150 of her fellow Elks scholars. Getting to be a part of the Elks’ 150th anniversary is something I’ll never forget. What made the trip so appealing to me was being involved in something that has never been done before and will never be done in that way again. None of us knew what to expect going into the convention center because everything was new; all the activities we were partaking in were happening for the first time. Knowing that we all got to be a part of the biggest gathering of Elks scholars ever was such a thrill! While I know there may not be another celebration as big as this to look forward to, I hope that I’ll be able to see everyone I met somewhere down the line, whether that’s on another service trip or a special visit. There’s this sense of family on the service trips that you can’t fully understand until you’ve been on one yourself. 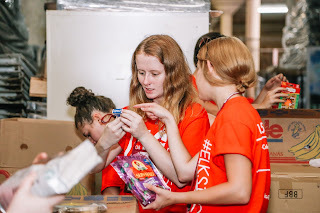 Knowing that I now have these connections all across the country makes me excited to continue to add to the list, and I look forward to reconnecting with my Elks family again.